I pinch myself every day to have the opportunity to meet and hang around incredible humans who overcome so many obstacles. 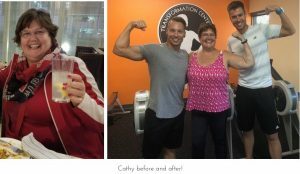 I hope you will be inspired by Cathy’s story. The one thing I want to point out from her story is that when she started, she could barely get to the ground or back up without help, but because we have incredible trainers here we are able to meet someone where they are and take them to where they want to be. January 2018 I was lost in my life. I lost my husband Mike to brain cancer June 23, 2017. Due to the stress over Mike’s illness and death I had gained all the weight that had taken me a year and a half to lose. I had knee surgery in December I needed to find a purpose in my life. End of February I joined the Transformation Center and the 1 pm Fit over 50 small group personal training session. I will not forget that first day when Dustin was there to help me get to the floor and show me how to get up. I still can’t believe how bad I really was that day. I could have given up but there was something about being there that helped me keep going. I set a goal to be under 200 for my 60th birthday. I missed my first goal by a week, but I did it. My next goal is to ride my bike in The Ride (to raise money for the UW Carbone Cancer Research Center) in honor of my husband Mike. The Ride is coming up this Sunday. I will do my best. A year ago I was 40 pounds heavier than I am today. My final goal is to keep working out and to keep dropping weight and getting stronger, both physically and mentally. I enjoy working out at the Transformation Center. Erin has worked with me to get me to where I am today. He worked around my injuries and surgeries. I get stronger every day and I am working towards getting strong enough to join the Killer Kurves group to prove to myself I can do it. I have 40 more pounds to hit my final weight goal but more importantly is for me to get stronger, and I know with the help of everyone at the Transformation Center I will meet that goal.